I wanted to make this a professional looking PCB, with smd components, everything crammed on it, but for that, I might as well get a PXFMINI. I changed my thinking, and built a flight FC to be cheap, available, breadboard and DIY friendly, but still look professional. That’s why I use ready made breakout modules with sensors and had PCBs made by OshPark. I bought an APM from 3drobotics a long time ago (well, at least technology-wise, it was a long time ago. 3 years maybe 🙂 ), and I really love it, still. I don’t really use all the features, but it’s nice to know they are there. I also really like like the opensource community behing it. So, yeah, after a couple of years, it was time to upgrade. I wanted to get the Pixhawk, but then dad got me the tiny Intel Edison, and some time after that, the PiZero was announced. Needless to say, I did not get the Pixhawk. I didn’t want to use the Edison for testing, so I got me a PiZero from Pimoroni, and started googling on how to do it. I came across this website, from this guy. This made thing SOOOOOO much easier. Thanks Patrick! Connecting it together part 1. First, we connect the sensor modules, check if ArduCopter starts or not. If it does, we move to connecting the periferals. 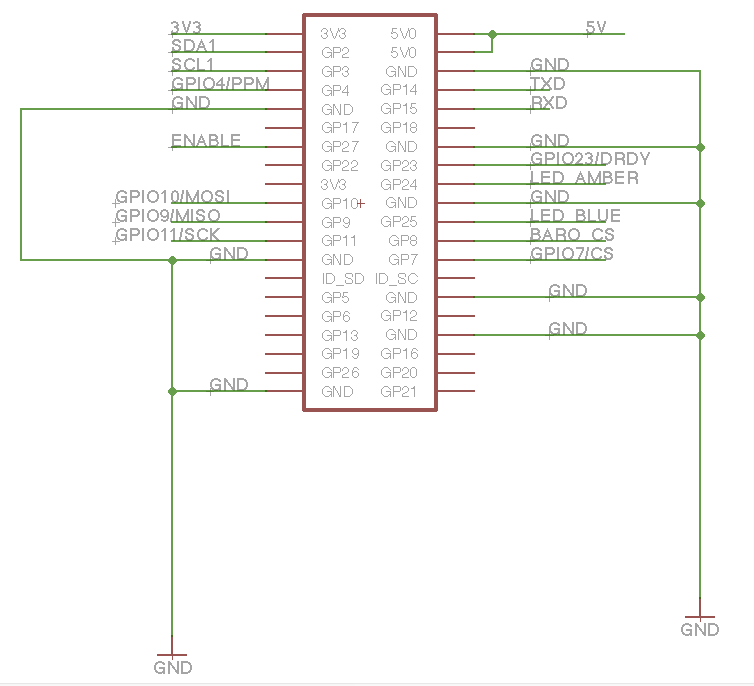 Gyro and baro sensor are connected through same SPI bus, just have different CS (chip select) pin, which is controlled by software. Or you can compile on the Zero itself. Hassle-free, just takes longer… not much, tho. I’m going to go with that. Install rasbian, download here, instructions also provided. enter Advanced Options, enable SSH, SPI, I2C, disable Serial. Now, we install RT-PREEMPT, which is RTOS patch, makes rasbian Real-time OS. Copy the commands from here, or even better, go to the original website, and check for new versions. This basically copies the precompiled kernel over our original one. Go to ArduCopter dir for copter, or ArduPlane if you want to compile for a plane. Connecting it together part 2. Now, that we have a working ArduPiCopterZeroDroneFlyingMiniLinuxComputer (I’m so clever with names, I know), we can start connecting the peripherals. 1,2 5V any 5v, to provide power to PiZero. 3. To drive the servos or ESCs, we need PCA9685. 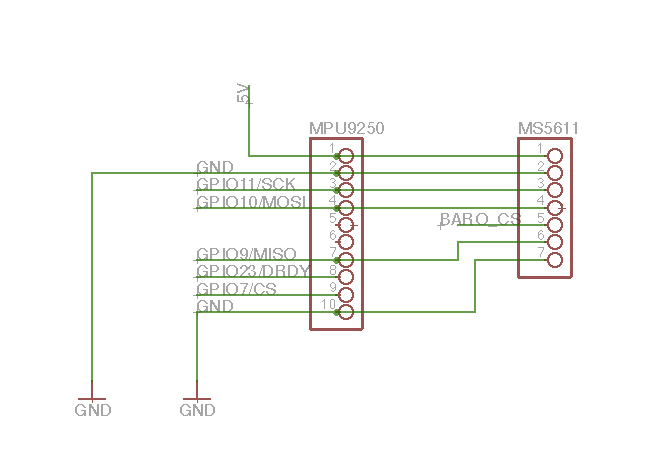 It’s an I2C enabled pwm driver, so just connect it to any I2c pins, maybe the easiest is to hook it up to ADS1115. As said SDA to SDA, SCL to SCL, 5v to 5v, gnd to gnd, no rocket science there.There is, however, a catch with 5v power rail… Wiring it like this does NOT provide to 5v pin on the ESC/servo connectors. For multicopters, leave it as is, but if you intend to use servos, connect 5v to vcc pin on the module, maybe put a fuse between PCA and RPI, just to be sure. Me, I just remove 5v wire from ESC, and connect vcc power to PCA. Your choice. 4. UBLOX gps module… I have one chinese and one original from 3DR. Shell out for the high quality one… That’s all i’m gonna say. The last one is probably the easiest, since you don’t even have to configure the GPS in Windows over FTDI converter. And that’s the one I intend to use. I could go into detail on how to set it with U-center, but I won’t, since it’s been done already. and you should see gps sentences being sent over to you. If not, probably switch RX and TX, or repeat step: Getting ArduPilot software. 6. OLED is a simple I2C device, so connect the I2C lines any where on the board, pins, rpi or servo controller. SDA to SDA, SCL to SCL and 5v power. 7. Besides that shiny, tiny OLED screen, I also wanted a different form of visual notification, the kind that you can see from outer space 🙂 Something like IRIS has, or the Phantom. I stumbled upon MavPixel. It’s a diy Arduino pro mini project, that scans the telemetry, and controls up to 12 WS2812 I2C rgb leds accordingly. It also comes with GUI configurator, which is basically a copy of Cleanflight’s Led configuration program, so it should be easy to figure out. When I get the LEDs, I will make another post, just for MavPixel. eagle layout change for the new combiboard CJMCU-117 MPU9250+MS5611 possible? Hi, I dont know, but I think it *should* work. From the looks of it, that module is wired the same as those two on my board. So I’m confused as to how to wire both a receiver and the PCA9685 to a set of ESCs. Do I need to splice the signal wire from the ESCs into both to allow manual and autonomous control? no, you don’t splice the wire. I use the PCA9685 module, and just connect the three wires to the module. there is no direct “manual” control, passthrough is passed through he APM. Connections are the same. Is it possible to use PWM output directly from the RPI? A) This build is based on the pxfmini that has a lot of similarities with the Navio, and both are using the PCA9685 for PWM. B) There is no consensus in the community as if the RPI can generate stable PWM using its own resources (see some discussion here: PIGPIO ) . So instead of going on the unknown I decided to stick with 2 generation of working autopilots and adapt the pxfmini code for my particular build. First of all, congratulations for the excellent work! I already ordered the PCB at OSH park, it was sent on June 13, 2018, but it should take a while to get here in Brazil. 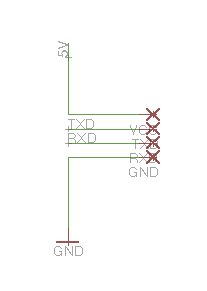 Do I need to solder any components on the board? How do I connect everything? 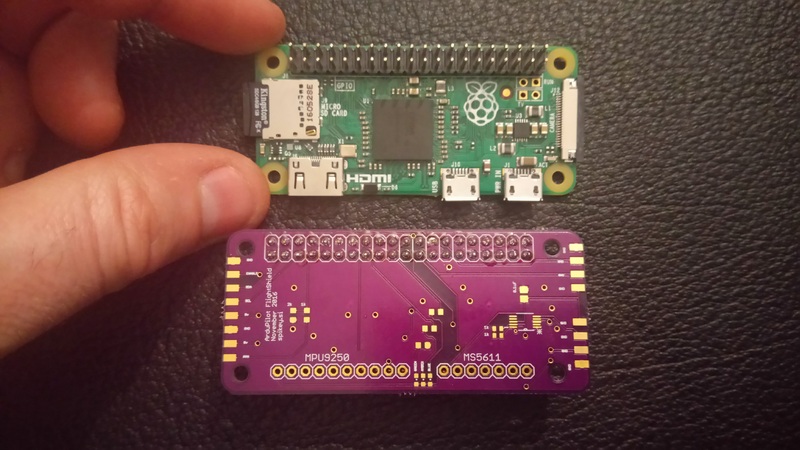 Stacking PCA9685 on Pi Zero and Purple PCB ArduPiCopterZeroDroneFlyingMiniLinuxComputer on top? Like a sandwich? Except for the modules, NO, nothing else to solder on the pcb. I glued the PCA on the bottom of the board, and the other two, I soldered to the top. That, I stacked on the PIZero. I received the PCB on June 25, came fast, they are beautiful !!! I have also received the MPU-9250 and MS5611. Yes, the boards really look amazing. Im planning to post an update to this post sometime this weekend. Hello this is a great project. I want to ask how to set all the electronic like ESC, battery, servo? I want to build my own flight controller for plane. thanks for your comment. What exactly are you having problems with? ESCs and servos are connected to I2C servo controller, from port 1 onwards. battery is connected to battery power module. you need to add a serial to usb converter, and connect that to the USB port on the RPI. Then start ardupilot code with the appropriate switch to send telemetry on USB. At this point I dont have a video, and I might not have it soon, because my rPi zero got reused in another project. Feel free to browse around and ask me anything. I will do my best to answer. the ppm broken problem on raspberry pi zero since arducopter 3.5 is it fixed? is this possible use external magnetometer? I honestly do not know what kind of problem you are talking about. I have not had any problems using any external PPM encoder. Yes, it should be possible. 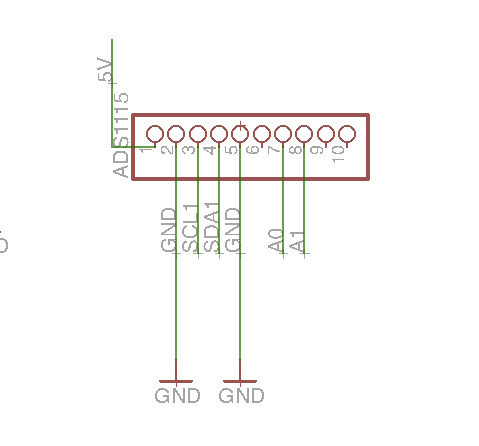 Connecting an external MAG to i2c line, and finding a suitable line in the code would be my guess. I have not done it before, but I think ArduPilot code is smart enough to use two or more of each sensor. Maybe something like HMC5843 would do the trick. Do you have any evidences(videos) about the real flight of your design? no, not anymore. Long gone now. Anyhow, this was just to prove to myself that I can do it. This was made from Patrick’s schematic, he also uploaded some videos. BTW, this is prettt old now, even Patrick move away from RPI, I think he is now building his own cape for PocketBeagle. do we need all the component to compile the code? what do we do after compile the code? And how to connet it to mission planner? what do you mean? you have to run it on RPI. connect it to MP with telemetry. I have never tried it with on-board USB. Here, do not forget to change?